K-Cups are expanding beyond coffee. Coke is coming to K-Cups, perking up Green Mountain Coffee's stock. Coca-Cola (KO) announced a partnership Wednesday with Green Mountain Coffee Roasters (GMCR), maker of the popular Keurig single-serving coffee machine. The news sent Green Mountain shares soaring more than 25% in Thursday trading. Green Mountain said it would undertake a "meaningful" share repurchase program to reduce dilution of existing investors' holdings. Coke shares rose about 1% Thursday. The firms will collaborate over the next 10 years to produce Coca-Cola products in single-serving plastic pods, also known as K-Cups, for use with Green Mountain's forthcoming Keurig Cold at-home beverage system. As part of the deal, Coca-Cola is paying $1.25 billion for a 10% stake in Green Mountain, and will help market the new product. The Keurig Cold system will be likely be released in late 2014 or 2015. It will dispense cold beverages "including carbonated drinks, enhanced waters, juice drinks, sports drinks and teas," the companies said in a joint statement. The Keurig Cold system will bring Green Mountain and Coca-Cola into direct competition with SodaStream, which already produces do-it-yourself soda makers and has seen strong growth in recent years. SodaStream (SODA) shares fell more than 10% in after-hours trading Wednesday. But shares of SodaStream were up 8% in trading early Thursday after Citron Research published a note speculating that Coke rival PepsiCo would have to respond to the move by joining with SodaStream, either through a partnership, taking a stake in the company or perhaps even buying it. "What is Pepsi going to do? Unless they believe that Coke is dead wrong, they have no choice: Hello, SodaStream!" wrote Citron in the note. Shares of PepsiCo (PEP) were slightly lower in Thursday trading. Coca-Cola CEO Muhtar Kent said the agreement was part of his company's effort "to identify and stay at the forefront of consumer trends driving the industry." Green Mountain chief Brian Kelley said the deal "combines The Coca-Cola Company's unparalleled brand, distribution and marketing strengths with GMCR's innovative technology and beverage system expertise." 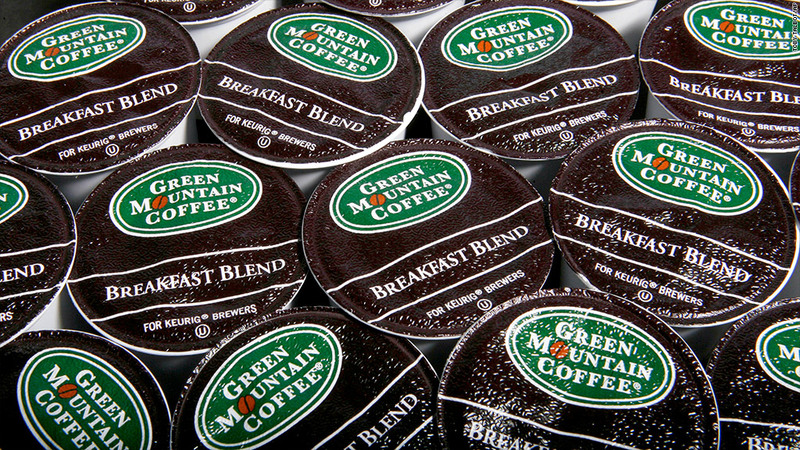 The partnership is great news for Green Mountain, which has faced increased competition in the single-serving coffee space after a pair of key patents related to its K-Cup products expired in 2012. Starbucks (SBUX) introduced its own single-serve machine that year, though it remains in partnership with Green Mountain to make products for use with Keurig machines.